Because I get to show you my UDI Blog Inspiration Challenge piece! This is the BEST challenge for me because I get to look at a picture or photo that our challenge Mom, Maria has sent and then I can let my imagination run wild! It's really a great way to get out of my 'box' creatively and truly, some of these projects are my most favorite! 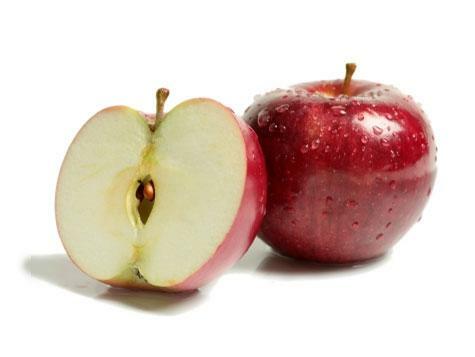 I started thinking about the significance of apples to our family. No, that's not strange! You see, every Fall, Mark, Emma and I head up to the Shenandoah Valley and pick apples at one of the many wonderful Virginia orchards. We always make a day of it, getting there early enough to eat homemade apple pastries (the apple doughnuts are to DIE for! ), drink homemade apple cider and of course, pick a 1/2 bushel of apples. When we get home, we spend time that evening making homemade apple pies from the crust up. We LOVE this Fall tradition and wouldn't miss it, it's so fun! It always reminds me of my Grandma somehow. I used to love spending time in her kitchen while she baked. I don't really like to cook - even though I can - but I really like to bake. That's what I learned the most from my Mom and Grandma. And my Grandma used to let me play with pieces of dough from her pie crusts, she even let me eat some even though you're not supposed to, and she would always let me help her decorate the Christmas Cookies. In fact, I still have her cookie cutters and we use them each Christmas. This card just makes me so happy to look at it! All the little antiquing details from the sponged paper ruffle to the Crochet Lace trim and Antique Trinket safety pin reminds me of my Grandma. Even the Woodgrain background makes me think of her kitchen cabinets - they were clear lacquered pine, very country, but oh, so pretty to me as a child. You could see the beautiful woodgrain in them, just like on this card. 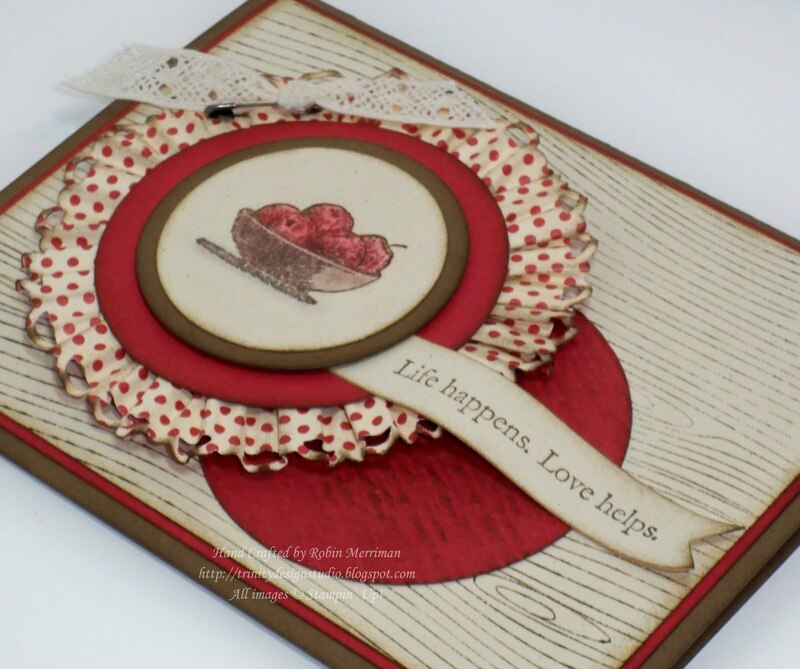 I used Soft Suede, Riding Hood Red and Naturals White cardstock along with some of the Love Letter Designer Series Paper. The edge is punched with the Scalloped Trim Border Punch and I ran it through my Crimper several times to make it pliable. It's simply gathered around the back of the Riding Hood Red circle that I punched using the NEW 2 1/2" Circle Punch from the Holiday Mini! It's awesome! I adhered it with Sticky Strip and it stuck beautifully! 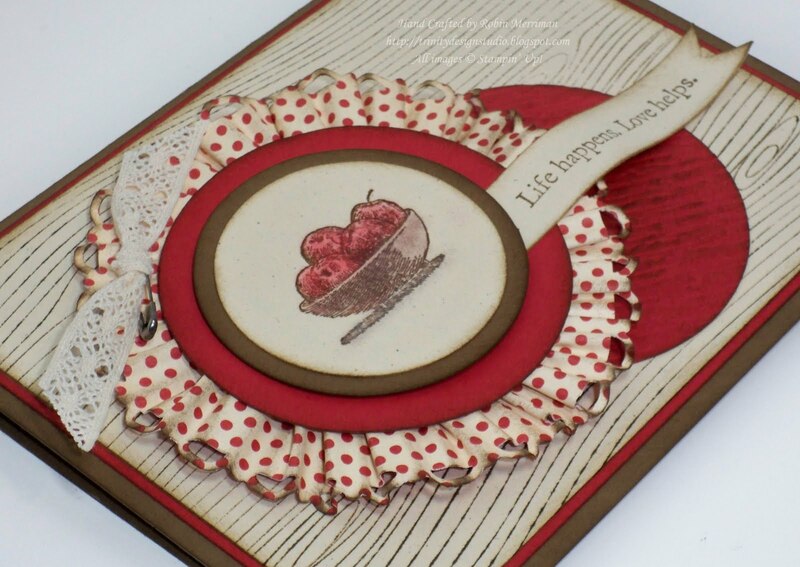 The focal image is from the Studio Sketches stamp set. 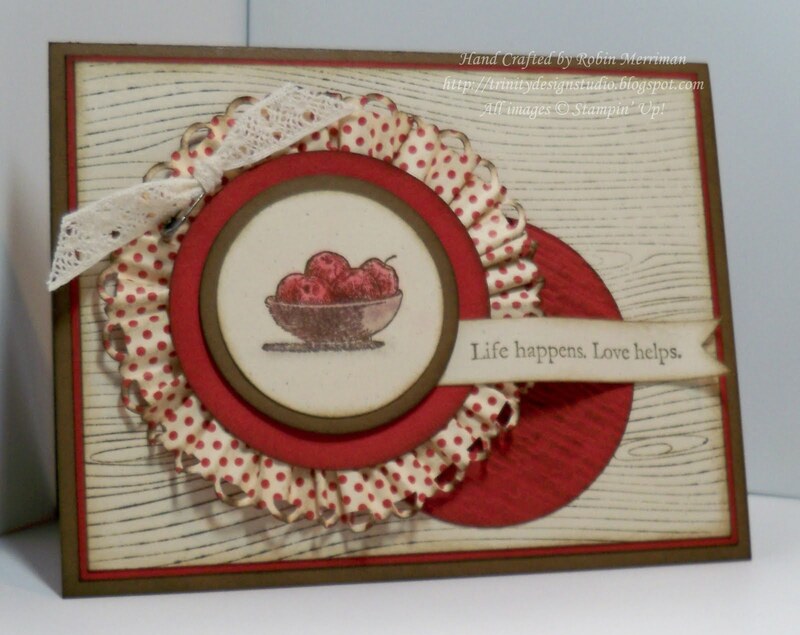 I stamped it with Soft Suede ink and colored it in using my Stampin' Pastels. Oh, so easy, and I love the soft look they give the image. I attached the piece of Crochet Trim with one of the Antique Trinkets, simply pinning it to the crimped paper circle. I did use Stampin' Dimensionals between several of the layers and everything was sponged with Soft Suede ink - every layer! The greeting is from the Vintage Vogue stamp set and I just curled it a bit with my Bone Folder and layered it on top of a Riding Hood Red circle cut with my Big Shot and the Circles #2 Die. I texturized it with the woodgrain Texturz plate and then sponged it a bit as well. Yep, Life happens. Love helps. Especially love in the form of a homemade apple pie. Love baked into every bite. I hope my post today has brought back some fond memories of Fall and family for you as well - be sure to check out the other Design Team's creations by visiting the UDI Blog. All Supplies can be ordered from my Stampin' Up! website Online store. Remember, each Online Order this month will receive the special note card handstamped by me AND you'll be entered into my NEW drawing for the Perfect Product of the Month! Oh my goodness Robin! I just LOVE it!! I too love the antique feel to it. Such wonderful memories!!! Robin, WOW! I love your card but I loved reading about your family traditions. You can see how it inspired your work. Great job! I just love this card....hope you don't mind if I case it. You really brought back lots of memories for me too. My Grandmother had Apple Orchards and would make dozens of pies at a time....I can smell them now! Yummy!! Thanks for refreshing my memories!! What wonderful memories Robin! Christopher is a huge apple pie lover. That was his birthday "cake" for quite a few years. This card is lovely! I am CASEing it for sure!!! So wonderful Robin and a lovely story to match a beautiful card! Thanks for sharing those memories with us. I've been craving apple pie for a week! (but i AM down 13 pounds so far on WW). :D This is just wonderful! I love the vintage feel. Absolutely stunning GF. Oh my gosh, your card is so beautiful and thank goodness for grandma's. My granny was the baker in the family, every single holiday!!! I still miss some of her stuff that she never wrote down. So the title of holiday baker fell to me. I should have spent more time watching and less time eating! Your card was definitely a trip down memory lane. Thanks for sharing. Fabulous card Robin!! Love how you went vintage too! I had the same thought to use Tart & Tangy, but went with my Studio Sketches too!! Om Robin you brought back so many memories of Apple County - we drove to my cousin's orchard in WVA and brought back to Springfield VA at least 10 bushels of apples to have fun with- creative apple sauce, pies etc...yes I shared the apples with others too!but the garage was cool enough to keep them wonderful for the winter!! Ok Robin you have to share with me what great orchards to visit up in Virginia. I'm relatively new to Lynchburg, Virginia (3 years) and still getting to know the place but would love to do a family trip to a fabulous orchard this fall. Please share! :) You can email me at csanchez@alum.mit.edu. Love your card too by the way.